The electronic thermometer in my truck said -13 degrees as I pulled up to my parking spot. I knew I was in for a long and frigid sit in the tree stand. But I was not deterred as I had proof that I was on the doorstep of a better than average buck. As I made my way to the stand in the pre-dawn darkness, my glasses frosted over completely about half-way there. I had to take them off to finish the journey. In the feeble light of my small flashlight, everything was blurry. But I managed to finish the 3/4 mile trek to my stand and after donning the warmer clothes in my pack, I climbed aboard. The stand was set up about 20 yards from the spot my scouting camera had occupied and was about 12 feet off the ground in an 8-inch diameter aspen. I normally like to be in a larger tree to help break up my outline but this one was the largest I could find in the immediate area. The bitter cold wind was steady out of the SE. It was not a good wind for this stand and I knew it. But it was where I felt I had to be. All was quiet as daylight sort of oozed on in and I didn't even hear many shots in the distance. Then about 8:30 am, I heard something moving through an over-grown marshy area to the NW, directly downwind. I grabbed my .270 just in case and studied the direction I had heard the noise. I caught a glimpse of a deer about 100 yards to the northwest, moving in a southwesterly direction. I was sure it was a doe but she disappeared too quickly for me to find her in the scope. Suddenly, a second deer appeared on the same path and I could clearly see a left antler. I brought the gun up but he had disappeared in the tangle of diamond willows and young aspens. The distance was too great for a clear view under those conditions. 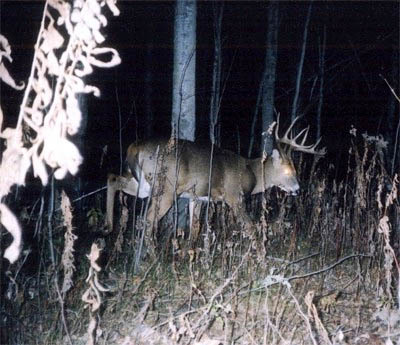 Could this have been my trail camera buck? I feared that it was and that It was likely to be my only sighting of him. After all, they had been directly down wind of me, so how could they not know that I was here? I had to keep telling myself that I had not screwed up and that maybe it wasn't even him. And so I continued the vigil. Hour after frigid hour passed by without a sighting of another deer. I munched down a couple of frozen ham sandwiches and some rock-hard almond joys. I had to chip the ice out of the throat of my canteen just to get some water to dribble out. I couldn't remember the last time it had been this cold on opening day. Yet I didn't even entertain the thought of getting down, much less leaving. That big buck was from a different world than I. He could not escape the cold and would no doubt go about his business without giving it a thought. He could be a mile away or he could show up from any direction at any moment. But if he was going to use this trail during daylight hours I had to make sure I was there to greet him properly. As the time ticked slowly by, I occasionally blew my grunt call or bleated my doe call. Then suddenly, at 1:20 pm, a very large doe appeared 40 yards south of me. She was moving from west to east and coming from the same area the deer from the morning sighting had disappeared to. She had no fawns with her so I reasoned that she may have a boyfriend following. I locked on her back-trail and studied it intently for 45 minutes. When nothing else showed, I went back to scanning in all directions. At 2:10 pm, all at once, there he was, picking his was through the aspen saplings and angling in my direction. Like a ghost he had just appeared and there was no question this was the heart-stopping buck from my trail camera pictures. I got the gun up immediately and waited as he continued moving in my direction. At 50 yards the trail turned directly toward me and when he reached that point he stopped in his tracks, his ears shot forward and he stared a hole right through me. Now I had a problem. He was directly facing me and I could only see one antler, one eye, one front leg and half of his chest. The rest was hidden behind an aspen tree. One of us had to make a move and I reasoned that any move he made would not be in my best interest. So I lined up the cross-hairs just to the left of the tree and six inches below his white throat patch, and squeezed the trigger. At the shot, he buckled and gave a couple of violent kicks. I quickly got the scope back on him and just dared him to get up again. But he didn't. He lay there motionless and I knew it was over. I collapsed on to the seat of my stand and just sat there stunned for 15 minutes. I was exhausted from the biting cold and the adrenaline high of the past few minutes and I started to shake. 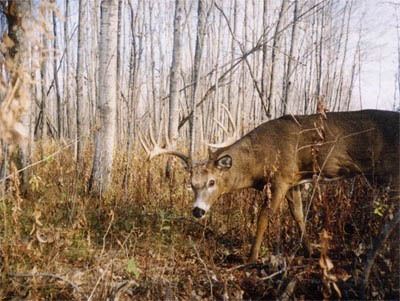 When I had regained my composure enough to safely climb out of my stand, I went to him and just sat there admiring the wide, sweeping, near perfect crown he wore. I gave thanks and thought about all the scouting and anticipation had led to this moment. And I knew then I might never harvest a better buck or have a better story to tell. 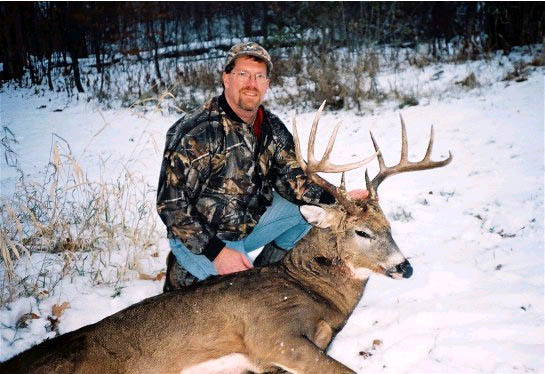 The buck weighed 213 lbs field dressed. He has 10 points and a 19-1/2 inch inside spread and after the 60-day drying period, he scores 152 - 6/8 net. His gross score was 154 - 4/8 with side to side difference of only 1-6/8" and no abnormal points. 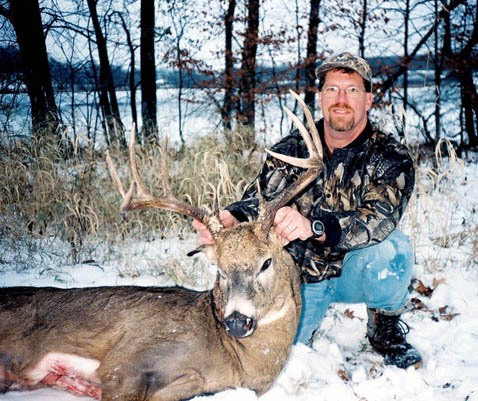 He was shot on November 8, 2003 in Northern Minnesota, on public land.